Provide a stable foundation for your cake / pizza and easily insert it in a box with this 10" corrugated white cake or pizza circle. Made of C flute corrugated cardboard, this durable circle supports and carries even the heaviest and most cumbersome cakes. Capable of absorbing grease and liquid, this is also ideal for serving up delicious pizza. The circle will also help maintain the pizza's heat. Even though this platform is circular, it's also great for holding square cakes. This cake circle is also rated food safe for direct contact on the kraft side making this item reversible. No matter the shape, this circle's bright white color accents your vibrant and detailed icing! Add this cake / pizza circle to your bakery, pizza shop, or market for quality support! This is the first time I have ordered these circles, I usually get the grease proof ones, but they seem to work just as well. These are used constantly in my bakery for smaller cakes. The work well and the cake and icing slip right off. I haven't found a better price yet. I have to admit, I was a bit skeptical of the quality, because of the price. Well...I was proven wrong! These cake circles are amazing! They are sturdy and do exactly what they're meant to do. When my supply gets low, I will definitely be ordering more! I use these or my cakes, tarts, pies and cupcakes. They hold up to wet fillings, heavy cakes, single or tiered. I have a whole case for my business. They can be covered with fondant, foil, or buttercream and hold up well. Our bakery mostly focuses on pies so we don't generally use cake circles, but these are perfect both for lining boxes for the small cakes we do and for putting under cakes we have on display in the case. They can be flipped to use either the white side or the brown cardboard side. These work great !! I dont use them on pizzas but I do use them as cake circles. They are not grease proof so they do have to covered with something. These cake circles are great additional support under our cakes. They aren’t the grease proof- so we use them with a greaseproof circle just to add extra weight support - and are cost effective. Value for money. Good quality and sturdy to use. These boards are not coated hence not advisable to be used for milk-based cakes. I generally glue multiple of these boards together to make a thick base cake board for my tiered cakes. Poor quality. Puts more work on yourself because oil soaks into the board, so therefore you have to move the cake onto a new board.these needed the wax coating that higher quality boards would have. i didnt like that i had to move the cake i had made for a customer to a different board because i didnt want them to see what was happening on the board their cake was on. I love how these circles are strong and durable for all cakes and pastries, I use these a lot when I pack my boxes with a lot of goodies for a good presentation and easy clean up. I absolutely LOVE these circles ! Very Sturdy and an AMAZING price for the amount you receive ! I used these circles for my Power Puff Girls bedroom cake ! Really great price for the value! I use these boards when I stack my cakes, they're easy to cut. Even nice when covering them with gold or silver. We purchased these for our frozen yogurt pizzas to sell in our freezer out front. These are nice and strudy for the pizzas. I will be purchasing these once we run out and the price is great as well! these are perfect for what I need I've use to buy them a few at a time but ordering these has saved me so much time and money. They hold up to the nicely. Good overall cake circles. Great price for what you get. They are very plain but that is what I ordered and didnt want to pay extra for any type of design. They are somewhat sturdy and hold our cakes well. These make for great support under cakes. I use them for transferring when finished and wrapping for service etc. Put them iin the fridge and pull out for plating. These are perfect for cakes. Only down side is you have to make sure the white side doesn't get wet. If so it sticks to the cake and becomes a pain. Other than that i would recommend this product. These corrugated cake circles are perfect for cakes. Thick boards that do not bend and work well with stacked cakes. I highly recommend to anyone that decorated cakes. I was so happy when I found these cake boards! You definitely can't beat the price and quantity that comes in the package and the quality is awesome! I love the white cake circles. They have made it so much easier for me to work. I used cut the rounds from flat sheets but these are well worth buying. Perfect, very clean and look great when peeking out from beneath a 9" cake. These support the weight of the cake nicely and protect the cake in the cake box. these help out so much when I make cakes for my customers. They don't leave the cake icing residue where they can see it, nice and clean! These are a great value. I go through a lot of boards, and these help keep costs down. They're also pretty sturdy, supporting my 11-13 pound cakes. Good product at a good price we go through dozens of these a day here at our bakery. I also like that they are easy to trim two different sizes. This is perfect for placing all of my deserts, pizza, and fried foods on. I probably should have ordered a size better however it is still perfect for my needs. Great rounds for decoration and for cake boxes. I use the frequently and would buy again and again. Nice and sturdy and keep greece marks off the box. We use these 10" corrugated white cake circles for both cakes and as secondary boards with dollies on them for presentation. They do bend, if picked up wrong, but other than that they are a great product. The corrugated circles are exactly what I was looking for. They are perfect for my cakes and even add extra support to my pies. I can stack my pastry boxes knowing I have the support of these circles! I love these they are thick and soak proof. They fit in the cake plate perfectly. I would definitely order these again in the future! Great purchase. These make packaging our layer cakes, bundt cakes, and cheesecakes a snap. Fits well with 10"X10" bakery boxes. I will purchase these again. These cake circle are awesome they did the job but next time I will order the non grease one had to wrap the with foil to prevent the grease from showing through the other side, they did the job you learn by your mistake. Great price. Quick delivery. Sturdy, bright white board. Works well under a tiered cake or use as a party cake board. Easy to cover or can leave plain white too! This is great for cakes, and has made the appearance of the cakes look even better! It fits perfectly in the cake box, would recommend! This is the second time I've ordered these cake circles.. This is by far the cheapest place to buy them in this quantity. The 10" size board is perfect for 6" and 8" cakes. Sugarless deLite feels this is the best price on these anywhere. Even with the shipping, the price is good. Ships quickly. Nice thickness and supports all of our cakes. These are sturdy enough to use just 1 board for a double layer cake or if you'd like to use for larger heavy cakes since the price is so great you can tape/glue a few of these together to great an inexpensive cake drum. Simply cover with foil, or contact paper and you have endless cake board possiblities. Being a small to medium size bakery, I am so glad that I can purchase these 10 inch grease proof circles in different quantities. They are perfect for dessert cakes and decorated cakes. Cake Circles work fine. They fit exactly in the 10 x 10 white bakery boxes I also bought from Webstaurant store - do not give any extra room so frosting easily rubs off on inside of box. very economical, I wasn't sure about the quality. i thought it would be really cheap. i was pleasntly surprised. it holds my big cakes as well as my cakes with heavy glazes. These cake circles are awesome. They are coated and do not get greasy. They fit great inside a box. They are very sturdy and do not bend. Good price on these sturdy cake circles. High quality product. I use these all the time for my cakes in my bakery. Two of them together is sturdy like a piece of wood. Use these on a Dailey basis for our cakes, pound cakes and such!! Purchase them again and again, will continue to do so!! Great price!! I order these cake circles once a year and they last the whole year. They work great along with the D&W 2-3 layer cake display. I had ordered the 12" as well and I am completely satisfied with those, these ones do get the job done but I am not sure if its the way the cut this ones that make the edges slightly weaker. I can't say enough about the value of this product! They are durable boards that make torting cakes so much easier! I use them every time I make a cake. They are the perfect size for a 8 or 9 inch cake with a small decorated border. These are all together perfect except they are not grease proof. I use them to decorate transfer cakes. The top layer cakes fit great and easily transport. I haven't found another use yet, but I am sure I will. Great boards. We use them between cake layers and as base plates. They need to be wrapped of course but they are cheap enough to use multiple to make cake drums. We tape two together and foil. They are very sturdy. These 10" cake circles are perfect for my 8" cakes! They are very durable and sturdy. This is also a great price for this quantity! I use these in conjunction with the parchment cake circle to place my cheesecakes on. You can also use these for your wedding cakes but I would suggest to put a piece of wax paper or parchment paper underneath so that the oil/butter won't seep through the board. Very sturdy cake boards and easy to cut to resize them if you need to. I definitely will continue to purchase these in the future because you just can't beat the price. Thank you Webstaurantstore.com!!!! These corrugated cake circles are very sturdy, not cheap or flimsy at all. They fit perfectly in the 10 in box and they never slide around or get bent. I highly recommend. 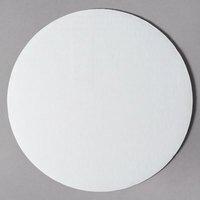 These 10" cake circles are a great value! They work perfectly for under my 10" tiers and I can also use them stacked to make drums for placing smaller cakes on. I highly recommend this product! these are priced so well, I can use these under even the cakes I make for home. That eliminates having to wash more dishes--use then just toss into recycle bin. Very heavy and sturdy, they fit the bill perfectly. Excellent price on this product. We use this for our cupcake business and it is wonderful. We will continue to use and order this item. I Love these, if I had the space I would buy a few different sizes as well. I take out several, put them in a zip lock bag (several sets) then store the large box in my storage room. They are so handy. I use the little doily on them and our cakes just look so much nicer than regular homemade cakes. Sometimes those little touches go a long way. These are great for stacked tiered cakes that will not have any board left uncovered. No need to cover it in foil just place cake and ice. Sturdy enough to support the weight of a triple layer cake without bending and breaking the cake. I love the 10" boards. They are great for using under tiers and they are inexpensive enough where I can stack them together and cover to make my cake drums. Just what I was looking for! These cake circles are strong and hold my cheesecakes beautifully. Looking forward to buying more in the furture. Thanks so much! Very good product. Holds up well. The price is reasonable compared to the other places that I have looked. It is a strong and sturdy product. We like this corrugated cake circle because of its sturdiness and averseness to grease. We often use these boards to stack cookies after they come off the cooling rack, prior to being decorated or packaged. This is great for take out cakes. I baked alot so the case of 250 is the perfect ideas to order. I recommends this items! I ordered these for use in our church bake sale... worked perfectly for 9" layer cakes. We also got related disposable cake covers for take away orders. The rounds are sturdy and are a very good value for the price. We use these for all of our custom cakes and wedding cakes. We wrap them in decorative foil for displaying dessert cakes. The boards are very sturdy! Had some issues with this cake circle. I tried to go cheap and purchased 250 of these non wax-coated circles. Regretted it the first time I used and all of my cake had a discolored ring around them as they absorbed oil. Lesson learned...pay a little more for the wax-coated ones. Luckily, webstaurant stocks a good supply of those. Thanks for your review! This product is a quality cake circle offered at a great price. If you want to prevent grease stains from showing, check out the 10" Corrugated Grease Proof White Cake Circle; item 24510CCCC. These hold up great for our homemade cheesecakes. They are sturdy and when portioning the cheesecake. They do not fall apart while we cut the cake. Work great with the Rubbermaid cake holder. Perfect size. No more need to cut to size. This is perfect for our 10 inch cakes. We just stack 3 together and cover with fancy foil. Perfect cake base. If I haven't raved enough about these boards, let me just add that they are very useful. I also use these boards like large spatulas to help stack the cakes together when I'm filling them. These corrugated cake circles are great for our pound cakes and other cakes. Very sturdy. We would order this product again, recommended. might try the grease proof ones next time, just to compare. The circles are great for holding an eight-inch layer cake. I also like to put three together as the foundation for holding the stacked fondant cakes. The 10" Corrugrated Cake Circle 250/cs. Is great for holding any round 9' cake.We are working on the bakery side of our restaurant.Getting supplies together .We are also going to take orders for specialty cakes. Thanks. Great for the purposes we need them for. Very sturdy and just the right size. Each is used for different applications, and cutting on them has been fine. These are great for any sort of cake; angel food, red velvet, etc! Nice inexpensive replacement for tart pans too! Very sturdy material sure to hold the heaviest of cakes! The 10" cake circles have held up very well. They are sturdy enough to support a 9" 2-layer cake without buckling in the middle. Extra support may be needed on really heavy cakes. This is a great cake round that is sturdy. I use this when cake decorating and cover it with decorative paper when packaging cakes. I highly recommend, and would reorder when the time comes. This cake circle is perfect. All were delivered in great condition. No imperfections. The outer edge was smooth unlike those from other suppliers. I will order these again in the future for all my stacking cakes. These are not grease proof so they stain badly. For most cakes they are sturdy enough, but be careful when carrying a really heavy cake on these boards. The board will bend. The corrugated cake circles are a very economical item for use with cakes, cheesecakes and more! I cover them with aluminum foil and display even my bundt-shaped caramel pull-apart rolls on them! GREAT product! Very good quality and excelent delivery. I use these almost everyday and have never had a problem with any of them. I will order these again. works great...sturdy and does the job. I used it on the middle of my first 3 tier cake. I used a 14inch on the bottom. these were the greatest for our Bake sale for relay for life. Everyone was so impressed and it was very convenient for us. Thank you so much ! These are perfect for cakes and pizzas. They make handling the food so much easier. Their sturdy construction allows you to lift 3 layer cakes without the fear of dropping them.